Cemeteries have always fascinated me. No, that’s not weird–that’s history! 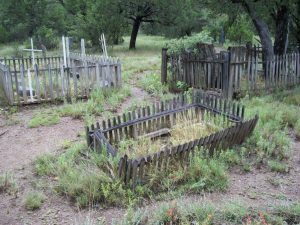 Here’s a glimpse into the story of the old Kingston Cemetery dating from the silver mining days of Kingston, New Mexico near Hillsboro and not far from Las Cruces. I encourage you to take a stroll through here sometime and imagine all the lives and stories that went before. We have come to the Black Range to camp, a two day respite from the dailiness of life in the valley, to reconnect. It is a good trip. I’ve never seen the mountains like this before. We’ve had so much rain this summer and frequent “clouding in” this weekend. Peaks and passes float isolated in the clouds. Gray streamers weave their way through the mountain valleys and canyons like some elaborate ribbon dance. I catch at old memories, grasping at some, pushing others away; they tangle, separate and come together again, weaving in and out of the mist. Descending the road to the old mining town of Kingston we catch glimpses of hidden places and side roads, beckoning like something half-remembered. The Kingston Cemetery crouches comfortably in the foothills of the Black Range, graceful in its spareness. No artificial flowers here, the people of these mountain families find beauty in the light and the granite and the hot smell of the juniper that has slowly grown here for lifetimes. We start together as we enter the cemetery gate, wondering aloud at the lives we see marked here. 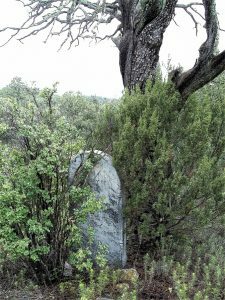 Most of the tombstones are being reclaimed, weathered by wind, sandstorms, mountain rain and the soft aging of decades that blurs the features, crumbles the granite to fine gravel under the trees in this harsh garden. A different kind of beauty here, scored by the names of men and women and so many young ones who never reached those milestones. We are fascinated by the etched dates marking their brief lives. Stopping in gratitude at the graves of a World War Two lieutenant and a soldier from a generation before, the first great war that should have ended all others, we render thanks for service given. We walk and ponder the hard lives of the people who ranched and mined, gardened and raised children, loved and got drunk sometimes and yelled and cried and died. Wandering the serpentine paths among the graves, our eyes are first drawn to one, then another, till we gradually become separated, out of reach of each other’s voice for a time, lost in our own thoughts, then coming back together where the paths cross. Asking, “Oh did you see that one, come here you’ve got to see, guess what I’ve found, you’ll never believe, oh, look how long she lived.” The comfortableness of a long marriage, able to go and explore and come back together, trusting that we will find each other again, calm in the separateness, rejoicing in the together. I explore the far corners of the cemetery looking for the stories of those on the fringes. Curiously, I find no markers out there, no headstones, no rock rings defining a resting place, no ornamental fence or even a beaten and weathered wood cross. Could be this western town more tolerantly incorporated its citizens in their final resting places. Or perhaps they are just forgotten by all but the mountains standing watch in the purple evening light. There is one more tombstone I haven’t looked at yet. I have purposely saved it for last, circling around it, wondering but delaying the knowing. I have been this way since childhood; the anticipation is a great measure of the pleasure. It is a lady’s; at its base is a glass canning jar with a piece of wide-ruled notebook paper folded up inside. It is written in crayon. Neither the note or the glass have started to yellow. 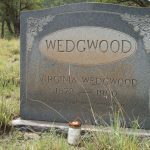 The white granite tombstone reads “Wedgwood” and I spend the drive home wondering about her and watching the mountains in the rearview mirror. Wherever the places you explore this summer, I hope they spark your imagination and make you wonder. When was the first time you saw your spouse? What do you remember about your first conversation? What was your impression of him/her when you first met? Describe your dating and courtship days. Recall any funny events during your courtship. What is your favorite story about your dating time? How long did you know each other before you married? How did you know you were making the right decision? What kinds of hopes and dreams did you have for your future? 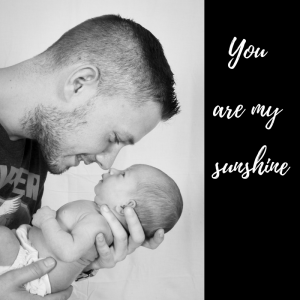 What is your favorite story about your early married years? Take these questions and sit with your spouse to reminisce and enjoy the story of your early beginnings as a couple. Or visit with older relatives to gain some perspective on long marriages and crafting a successful shared life. to be able to persuade my wife to marry me. May you have a long and enriching marriage. 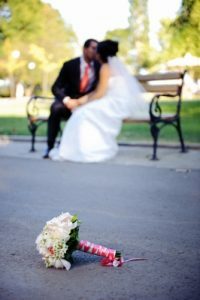 Take time to celebrate life and your shared history with your spouse. teach them and share what you’ve learned. bless them with everything in you. When Was the Last Time You Rode This? was learned at the cost of skinned knees and barfing in the bushes after riding this little baby! 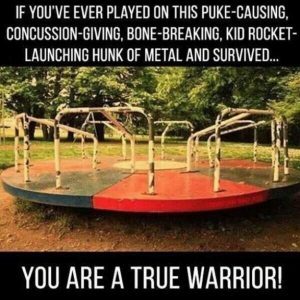 You can’t hardly find these anymore, how are we going to pass these life lessons on to our kids and grandkids? If you enjoy this type of humor and need to lighten up your day check out Don’t Forget to Breathe on Facebook (I haven’t looked at everything, but it touts good clean humor and I like what I’ve seen so far.) A little humor to lighten up your life this weekend. Remembering the Time is now on Pinterest! The Awesome Sauce has been cooking for the last couple weeks but now it’s ready. You can find the curated best that I’ve rounded up for you all in one place. These 11 boards of inspiration, helps, tips and sometimes just plain fun are sure to help you get started sharing your story as well as looking for the stories around you. They might be right there in your own family. They might be hiding in plain sight in a conversation with an old friend. I’ll add more inspiring, helpful pins and refine as time goes by (I think that’s a song title). Here’s the Remembering the Time Pinterest boards that are up for exploration right now. Hope you enjoy! New Mexico History–because, well, I’m a NM girl and I love this state. Lots of great historical photos. Please take a look, have fun, re-pin, use and send me any great ideas you find. I’d love to hear from you! I’ve got my farmer hat on today, irrigating my small pecan orchard in the first high temperatures of the year. We just went over 100 this week—summer is here! This hard, grubby work gives me just a taste of what my pioneer relatives must have dealt with to eke a living from the land. Wow—am I glad for ice cream, air conditioning and maybe a bit of Pinterest when the job is done for the day.